Reference number for this case: 11-Oct-54-Nandy. Thank you for including this reference number in any correspondence with me regarding this case. One Mr. Demarchy, a butcher from Seine-Port, and one of his friends, who drove by car to Nandy, said they saw "a luminous disc moving about 800 meters of altitude." The two butchers had come down from their car and "followed the moves of the craft for about a minute." 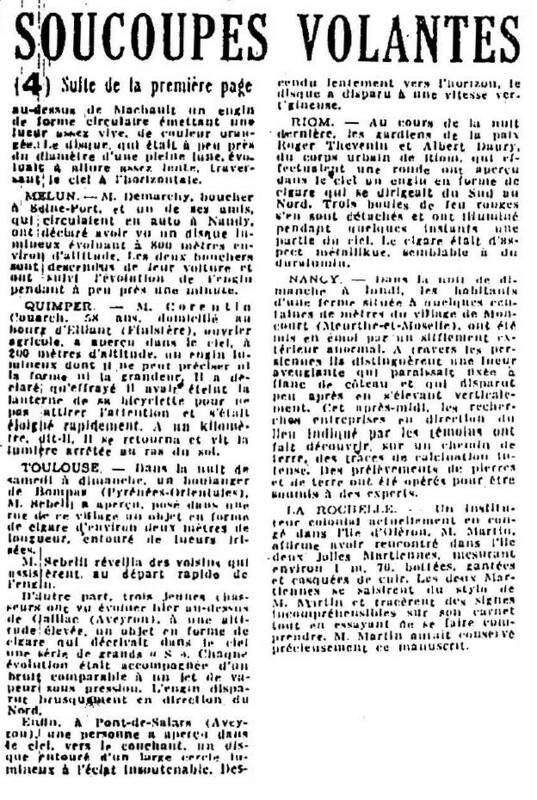 Also on October 13, 1954 the newspaper L'Est Républicain gave the same information, while the national newspaper France-Soir gave one day before, October 12, 1954, the place of the observation as being Savigny-le-Temple; which is 1 to 2 kilometers from Nandy. YAOUNDE (Cameroon), Oct. 12 ("France-Soir" news brief). - An enormous illuminated disk was observed Sunday in Yaoundé by a group of trustworthy people: Colonel Cauvin, director of the health and prophylaxis services of Cameroon; Dr. Menn, chief medical officer of the hospital; MM. Dumont, Director of the Security Services; Poileux, Councilor of the Territorial Assembly; Moreau, administrator and deputy mayor of Yaoundé. It was the dog of the house who, by barking, attracted the occupants. Under the disc hung a sort of oscillating cylinder. The machine, after a few seconds, disappeared quickly towards the east. Mr. Martin is currently on vacation on the Oléron island. He is resting, contemplating the waves and the pine trees forest, from the heavy climate of Africa under which he teaches the little black kids to read and write. Hiking is his favorite pastime. The walk he made on Monday will surely stay in his memory. At the turn of the path that smelled a good autumn air, he saw two pretty girls he identified as Martian. They were about 1m70, were wearing boots, glove and had leather helmets. Mr. Martin, barely recovering from his surprise, wanted to start a conservation, but failed to be understood. An unidentified object was sighted, but with appearance and behavior that most likely would have a conventional explanation. One object was observed by one witness. The information is totally insufficient to establish what the two men had seen with any certainty, but it is obvious that a meteor is possible. The villages of Nandy and Savigny-le-Temple almost touch each other, the two men were probably between these two villages, after Savigny-le-Tempe, going to Nandy, to reach Mr. Demarchy's home in Seine-Port just after Nandy. 1.0 Patrick Gross September 18, 2014 First published. 1.1 Patrick Gross September 21, 2014 Addition [ha1]. 1.3 Patrick Gross January 4, 2017 Addition [fs1]. 1.4 Patrick Gross February 10, 2019 Addition of the Summary. Explanations changed, were "Not looked for yet".